« A Pleasant Visit to Worthington Assembly Inc. In this and the next two three blog posts (Part 2, Part 3, and Part 4), I will describe how I reverse engineered a few off-the-shelf wireless temperature, humidity, and rain sensors, and used an Arduino (Update: RPi is also supported now!) to listen to and decode the sensor data. This has been a really fun journey and I will document the process as thoroughly as I can. Because there are lots of details, I don’t want to jam everything into a single post, so I have split the whole story into three posts. 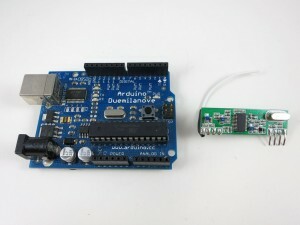 The Arduino and RPi programs are provided at the end of each post. The first question to ask is always: why am I doing this? Well, for good reasons: these off-the-shelf sensors are cheap, well-built, outdoor-proof, battery-driven and power efficient. If your project needs local weather data and you don’t want to spend time building your own transmitter units (which would bring up a whole bunch of engineering issues), these cheap sensors are the way to go. My original plan was to make use of the sensor data for sprinkler control systems. I actually set this as my next challenge to tackle in a blog post I wrote two years ago. It’s a shame that I lost track of it since then. But hey, two years later, I finally finished it. Better late than never! Here are the three sensors that I gathered and will use as examples in the following. They all work in the 433MHz frequency band. 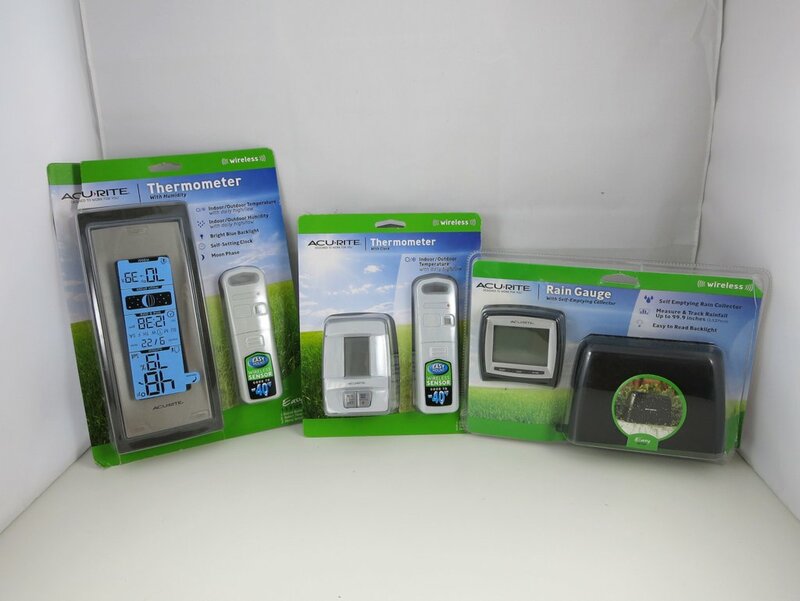 Disclaimer: I am not associated with Acu-Rite in any ways, I just picked these sensors because they are common in retail stores. The tools involved are quite simple: I used an Arduino and a 433MHz receiver. You should use the superheterodyne type of receiver as it has very good signal-to-noise-ratio. The super-regenerative type is too noisy and will only work in short range. Also, to obtain an initial waveform in order to bootstrap the process, I used a RF sniffing circuit from my previous blog post (about interfacing with remote power sockets), a PC with line-in port, a 3.5mm audio cable, and the free Audacity software. If you don’t have a PC with line-in port (most laptops these days don’t have), you can buy a USB sound card which has line-in port. Raw Waveform. 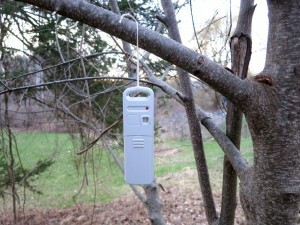 The temperature sensor is the simplest, so let’s take it down first. What I have at hand is an Acu-Rite 00782W3 indoor/outdoor temperature sensor. 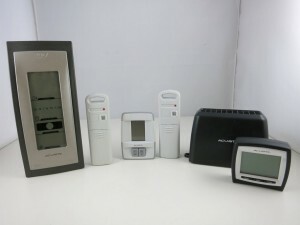 The package includes a receiver display unit, and a transmitter which sends a temperature reading every 1 to 2 minutes. Pop in the battery, power on the RF sniffing circuit, and launch the Audacity recording software, I got a waveform like the one shown on the right image below. Each transmission consists of 8 repetitions of the same signal. Every two repetitions are separated by a constant low sync signal that’s roughly 400 samples (in Audacity you can select a region and see the sample count). Given that the sampling rate is 44.1kHz, this is roughly 9.0ms (400 / 44.1 = 9.07). The bit patterns are pretty clear: logic 1 is a constant low of about 180 samples (4.1ms), and logic 0 is a constant low of about 95 samples (2.1ms). Every two bit is separated by a constant high of about 24 samples (0.54ms). Create Temperature Variations. In the next step, I will create temperature variations so I can get a lot of different signals and reference readings. By checking how the signal changes, hopefully I can decipher the coding pattern. 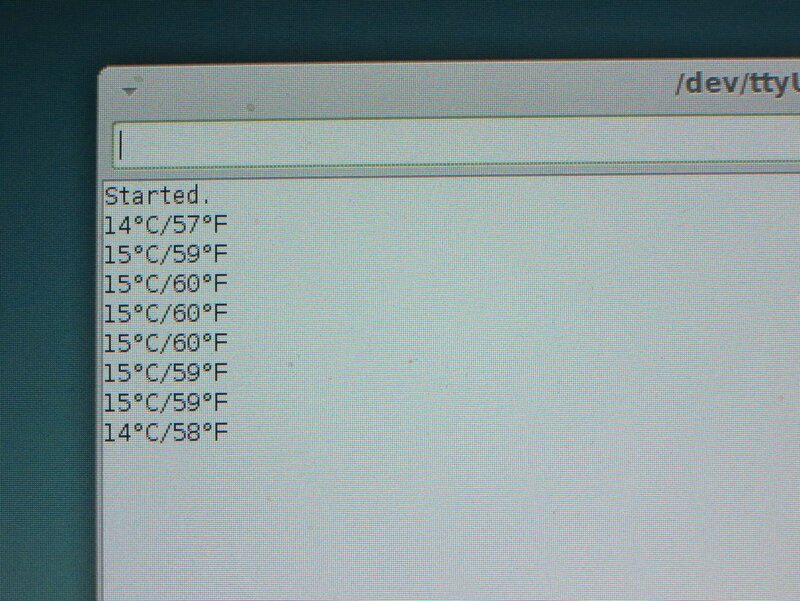 How do I vary the temperature? 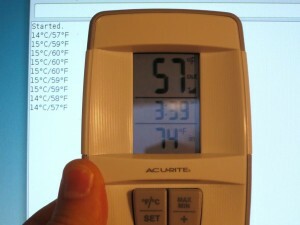 Simple: use a hair blower to increase the temperature, and throw the sensor into a fridge to decrease the temperature. But I am not in a hurry to do that just yet — manually translating the waveform into bits is very tedious, and I worry that if I make a mistake that can compromise the analysis. So I need a way to automate the signal capturing process. Since I already know the signal timings, I can create an Arduino program to automatically translate the waveform into bits. This will make the capturing process a lot faster. An Arduino Program for Bits Conversion. To get started, I connected the VCC, GND, and DATA pins of the RF receiver to Arduino’s 5V, GND, and D3 (interrupt 1). Then I wrote an interrupt handler to process the captured signal and convert it to bits. Earlier I’ve studied the RCSwitch library, which gave me a good idea of implementation. Technically, the interrupt function is triggered every time the signal changes from high to low (falling edge) or low to high (rising edge). A ring buffer is used to track the timing between every two triggers. It then checks the timing to see if a sync signal (roughly 9.0ms) is present. Because the signal may still be noisy the first time the sync signal is received, we will wait till the second or third time it’s received to actually do the bits conversion. Collect and Analyze Data. Now let the fun begin. With the Arduino program, I gathered a lot of data under various temperatures. Make sure to also gather some low temperature reading by putting the sensor in a fridge: I was surprised that the signal can actually go through a fridge door! Here is a selected list. The number at the end of each line is the reference temperature value shown on the display receiver. Now the coding pattern is a lot more clear. The first byte is always the same, so it’s probably a signature or channel byte. This is used to avoid interference among multiple transmitters. Note that this byte is different from the one I manually wrote down, so I suspect the transmitter changes the signature every time it’s powered on. The second and third bytes show a clear trend as the temperature goes down. The last byte has no clear trend. It’s possibly some sort of CRC checking byte. So the temperature, in Celsius, is given by the 12 bits (shown in blue), divided by 10, and rounded to the nearest integer. Aha, that’s it! Now I can modify the Arduino program to not only print out the bits, but also decode the signal and get the real temperature values displayed onto the serial monitor. Update: the code is adapted to RPi as well, using wiringPi. The code below uses wiringPi GPIO 2 (P1.13) for data pin. Note that the program uses pretty tight margins (1ms to 2ms) for screening the signal timings. Depending on the quality of your 433MHz RF receiver, you may have to increase the margin to improve error tolerance. 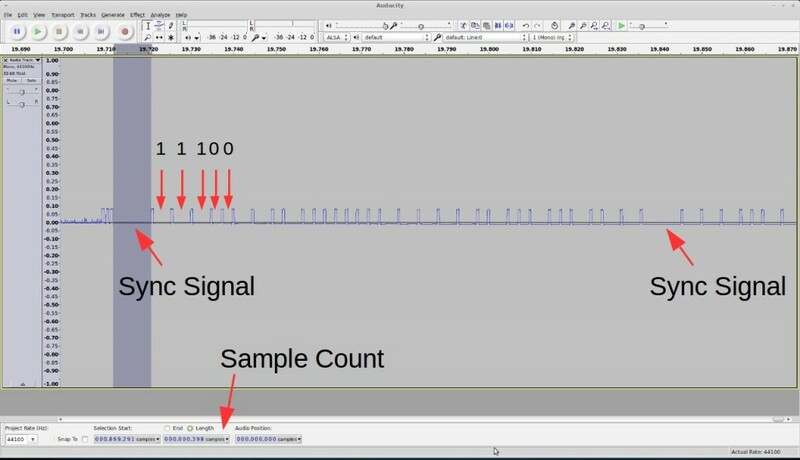 Use the RF sniffing circuit and Audacity to capture an example signal; examine the signal and estimate timing information. 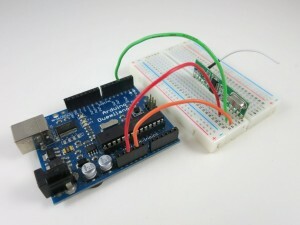 Write an Arduino program to automatically capture signals and convert them into bits. Collect a lot of data, record the bits and write down the reference temperatures. Examine the changes in the bits as the reference temperature changes, identify those bits that matter, and reason about how they translate to the reference value. Modify the Arduino program to decode the bits into temperature value. Continue to Part 2, Part 3, and Part 4.
prev: « A Pleasant Visit to Worthington Assembly Inc. I started reading where you assumed the measurements would be in Fahrenheit and knew that was not going to end well 🙂 The rest of us use metric. It’s actually not a terrible assumption with Acurite hardware. 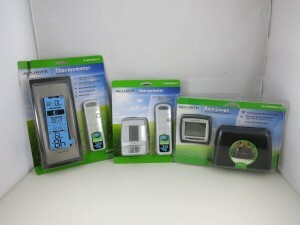 The protocol between their smartHub and myacurite.com is derived from the weatherunderground.com PWS protocol which uses all Fahrenheit. Is it possible to have multiple 433 temp sensors and one rpi receiver? I looking to have 6-8 temp sensors around the house. Yes, as long as they have different signature bytes so you can tell them apart. I bought a RFtoy from you recently but i’m new to arduino and trying to understand more by reading a lot of infos. Would like to ask if I could sniff 2.4G signals instead of 433mhz? I found a LED down light which can change from cool white to warm white and can be dimmed as well. It response to a 2.4G remote. I am thinking if I could use send out the 2.4G codes then it will allow me to interface it into my Vera HA controller. What i want to achieve is to use nRF24L01 to sniff the remote codes then use Vera + (Arduino+nRF24L01) to control my down lights to change from cool to warm whites and also to dim the lights using the learned remote codes. Could you give me some advice on how to achieve the above? 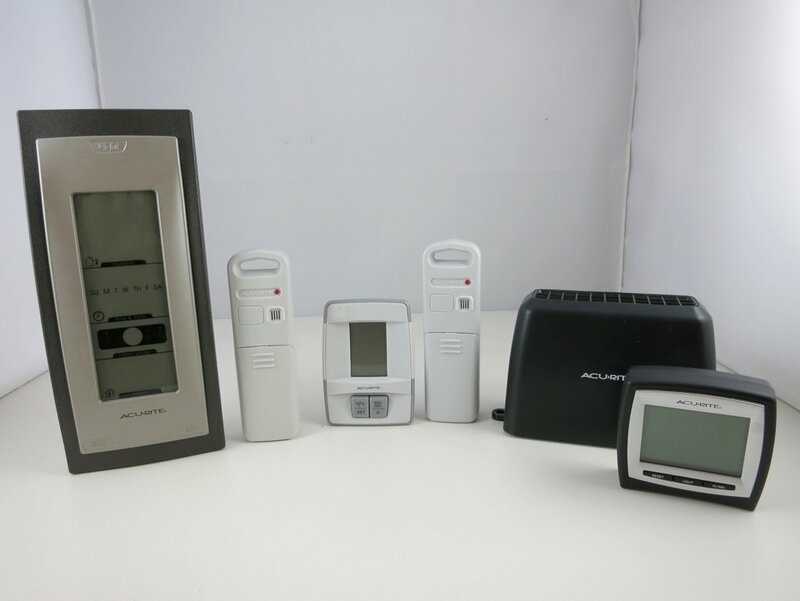 To sniff 2.4G signal, you need a 2.4G transceiver, such as the nRF24L01. But keep in mind that how feasible it is to sniff the signal depends on the encoding scheme — if the signal is encrypted, it will be very difficult to reverse engineer the data. If your LED light has an open API, it may be easier to direct use the open API to operate it. Just thought I’d lend some recent experience with this. 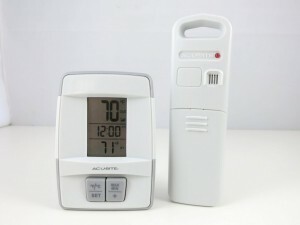 I bought a temperature/humidity sensor (https://www.acurite.com/digital-indoor-outdoor-temperature-humidity-monitor-00611a2.html) from the local Menards and you’re work was a tremendous help in getting data from the sensor! That said, I found that it oddly followed the communication protocol as you have documented here in part 1 instead of what you found in part 2. The only real difference is there being 5 bytes sent instead of 4, the 4th byte containing the humidity. As was pointed out in comments in your later work, the checksum is just a simple additive check; I found the easiest way to calculate it was to add bytes 1-4 (or 1-3 in the case of temperature only) to a byte variable. This automatically keeps it truncated to one byte and makes for a very quick and simple check. I did try using the receiver that came within the display, finding it was a separate module, but ended up changing to a SparkFun unit as the acu-rite one received too much noise; especially from one of my monitors. Once again, thanks for all the work you did on this as it definitely made development a lot faster! Cool. Glad it could be of any help to your project. – Anemometer: send data every 0,25 s. 3 s average are gusts, 10 minute averages the averae windspeed. You get the picture. Can anyone tell me if this is difficult. Because just hooking up a sensor to a transceiver I think means little.The tranceiver on its own probably won’t know what to do with the signals? How do you set them to send every few seconds?? Etc? How can I compile the RPI version ? Hi, I get the programm work, but can’t read from my sensor…..
Did you make any progress with the TFA sensors? I did my best, but am unable to receive any data with the program for RPi. The receiver/transmitter is working, because I am able to receive/send signal with 433Utils (RFSniffer) from my ON/OFF RF switch. First, I tried your default app where you have nearly same values: not working. …so I am working with correct values. But then why I am unable to receive anything with your code? My best suggestion is to insert debugging code to help you figure out why it’s not parsing. The easiest way is to insert printf’s in the code. This will help you figure out if the code can detect the sync signal, and each of the signals following it. There is no generally agreed protocol for wireless sensors — the code I published is written specifically for the sensor I bought, and your sensor may have a completely different protocol. Using your code, my 2 606TX sensors work just fine. In order to tell them apart, I added the ability to turn the first 8 bits in to the rolling code number. Now, I know which unit is sending the temperature. Problem is, sometimes an erroneous bit stream comes in and it gets decoded with a different rolling code number. Other times, the temp is WAY off. It has been mentioned that there is a CRC number sent, but I find no one with code to decipher and my efforts so far have been for naught. Any clues on how to weed out the bad data streams? The conversion to F seems to be messed up if Celcius is a negative number. For example if Celcius is -4 then it doesn’t take the – into account and does the math for just 4C which comes out to 39F. Any thoughts, I am researching now. I figured it out. Add int Celcius = 0; just under loop and in if (negative) add the following two lines. Thanks for the code. Looking forward to getting my Weather Station up and going. OK, glad you figured it out. The code takes into account negative values — search ‘negative’ in the source code and you will find how it’s handling it. Not all wireless sensors use the same encoding, so you have to look at your specific sensor to see how it encodes negative values. Many many many thanks for this tutorial. Without You I would not come at it. Have a nice day. Using the above way, i tried recording, with Audacity the signal from the data output pin of a 868Mhz receiver module, hoping to obtain the data bits. But instead i obtained a signal that almost looks like squares, but problem is the signal also has negative values, i mean under the zero line. Besides the squares, ocassionaly the signal also contains one or two saw tooths. Please advice how can i get positive only values for the signal, and how can i convert the signal to bits. Thanks for a great guide. According to the instructions, I managed to receive and read the temperature signal from the weather station sensor. I measured signal parameters in Audiocity. Each transmission between the flashing of the diode on the sensor contains 11 repetitions of the same signal. Every two repetitions are separated by a constant low sync signal that’s roughly 173 samples (173 / 44.1 = 3.92 ms). The bit patterns are quite clear: logic 1 is a constant of 84 samples (1.9ms), and logic 0 is a constant low of about 44 samples (0.97ms). Every two bit is separated by 24 samples (0.54ms). 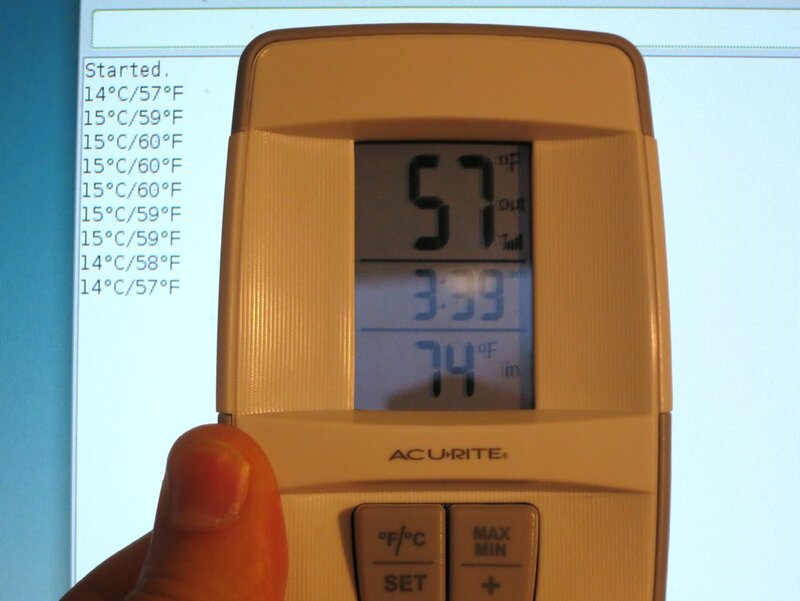 The third bit gave a temperature of 24.7 C, which is consistent with the reading on the station’s display. Unfortunately, the program does not work. Nothing is read. Please help. I’ve been sitting here for a week or so. It frustrates me that I can not use such a great tutorial. You will also have to change the transmitter ID code in the program to match that of your transmitter. It’s probably the first 8 bits of the signal. But you’ve also shown four extra bits so I’m assuming that there is far more data coming from this transmitter. I suspect that the last four bits are the ID for the sensor being transported. I don’t know this, it’s just conjecture. 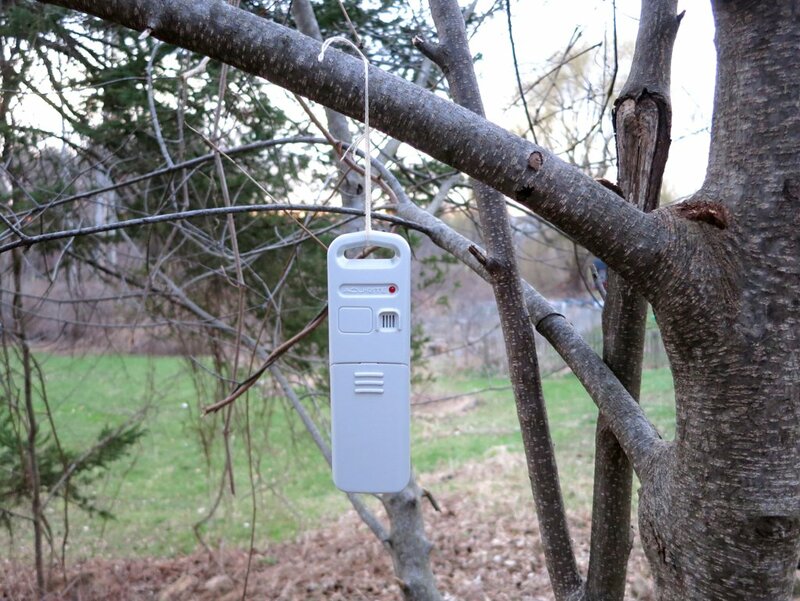 Looking to build a variation on this to locate a lost 433 MHz weather station remote transmitter that is still sending data to the receiver unit. Is there any way to measure signal strength so that if you walked the house and property the signal got stronger as you homed in on it? That’s great to know. Thanks for sharing.